The ability to control prosthetics with only the power of your mind has been around for a while, but it typically requires control electronics implanted directly into the patient. With this new, non-invasive method developed at the University of Houston, however, amputees can command their robotic limbs without surgery. Instead of implants, the UH system uses a wearable "thinking cap" (aka an EEG) that monitors brain activity externally through the scalp. A brain-machine interface (BMI) then interprets these brain waves and converts that intention into mechanical motion. Basically, the patient thinks about picking up an object, the BMI recognizes the intention and then tells an attached prosthetic to do so. Even at this early stage of development, University of Houston researchers have gotten the system to work properly 80 percent of the time. The team's findings were published this week in the journal Frontiers in Neuroscience. 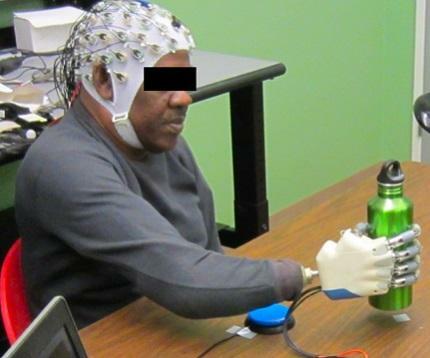 It's reportedly the first time anybody's been able to get an EEG and BMI to work this well with a multi-fingered prosthetic hand. The researchers hope that this new system will avoid the pitfalls of implanted controls (like potential infections or rejection by the body) while providing patients with more accurate and intuitive control. Not only should this lead to better and more responsive prosthetic devices, the collected data on how our brains communicate with our limbs could also improve treatment for people suffering from stroke or spinal injuries.